Chutzpah is a Yiddish word meaning gall, brazen nerve, effrontery, sheer guts plus arrogance; it's Yiddish and, as Leo Rosten writes, "no other word and no other language" can do it justice. This example is better than 1,000 words. Read the story below the picture and then you will understand. 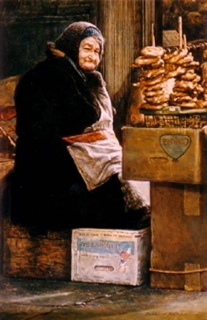 A little old lady sold pretzels on a street corner for 25 cents each. Every day a young man would leave his office building at lunch time, and as he passed the pretzel stand, he would leave her a quarter, but never take a pretzel.